Age Spots is a meditation on the nature of growing older: although our external appearance changes and our bodies may betray us with indignities large and small, our hearts and spirits can still be as young as those of a six year old. The kindergarten-bright colors and classic hand turkey are, of course, a reference to youth. 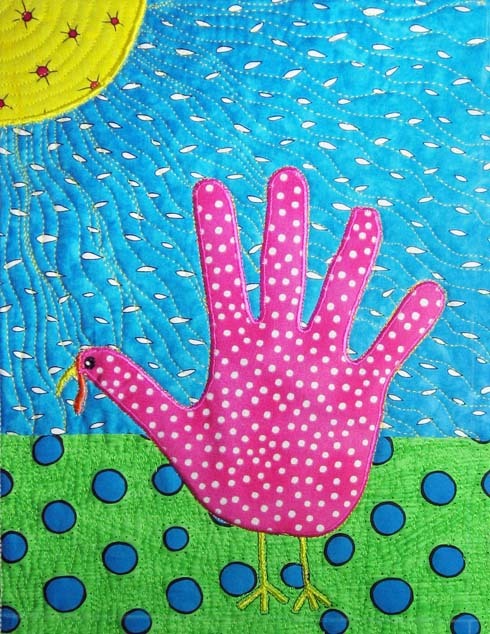 The spotted fabric used to create the hand turkey alludes to one of life's little ignominies, getting age spots.